The Sierra Madre Tattler! : Mountain Views News Local Primary Endorsements: All Pro-710 Tunnel Candidates? Mountain Views News Local Primary Endorsements: All Pro-710 Tunnel Candidates? As you know, the local litmus test here at The Sierra Madre Tattler this election is whether or not a candidate supports the construction of the godawful 710 Tunnel. A project so environmentally hostile to the well-being of those human beings living in this part of the world that you'd figure opposition to it would be pretty much automatic. As Ms. Carter-Henderson-Poole states above, "Act as if your life depends on it because in fact, the quality of your life does." In this instance that is certainly the case. Which makes her support for tunnel devotees Judy Chu, Chris Holden and Kathryn Barger all the more puzzling. There are plenty of candidates available who do oppose the hole from hell, so why would anyone pick only those few who have stated they support it? For the record, I don't know where Chris Chahanian stands on this matter. Even though the 710 Tunnel is among the most important local issues facing our region these days, there is nothing definitive about it on his campaign website. Just some vague references to "transportation," followed by a punt. Chahanian is running against Anthony Portantino for CA State Senate here, a candidate who has made his opposition to the 710 Tunnel very clear. You'd hope Chahanian would have also taken a stand on this issue by now with the election just two days away. Here's another thing. Who exactly is Susan's "editorial think tank?" None of her editorial page columnists even deign to write about local issues. It's all warmed over national nonsense. And when is the last time you have seen one of her supposed reporters write a news piece about anything having to do with Sierra Madre politics? That has been the exclusive purview of this paper's publisher for years now. Besides, many Mountain Views News current events articles are press releases. With the possible exception of the docile Dean Lee I am not sure this paper even has a reporter. You'd think Susan would show her readers a little respect and just admit the above endorsements were all made by her alone. And who knows, maybe even throw in a reason or two for making these selections while she is at it. I'm not sure mysterious references to "central committees" really cuts it. Because a candidate's position on nthe tunnel is the only valid criterion for choosing a candidate. Rather myopic, no? What are the other local issues that a state Assemblyman, Senator or County Commissioner should be addressing this election? And why would they take precedence to the widespread concern over the tunnel? Because picking a candidate for their one party, or one position on abortion isn't myopic? Give me a freaking break. I think 5:54 doesn't want people to be too concerned about the tunnel because it would be inconvenient to his/her candidates. I consider "the tunnel" to be like the Monastery,it will be built someday but hopefully I'll be dead by that time. The state can't afford to keep murderers in jail. Too much pension debt. Some of which goes to the jailers. Next we'll be welcoming half-way jails into our neighborhoods as a gesture of goodwill. This is not what the article said! It may help if you have it being read to you by someone. I read the article and it seemed pretty accurate to me. Have you tried using a magnifying glass? You have a significant reading comprehension problem. Mrs. Harris has not advocated for a murderer to be "free" but to be imprisoned. The tunnel is so important an issue in Pasadena that the mayor is putting it on the November ballot. Issues rise to the surface and under that is the rest of the candidates party platform and affiliation. I guess Susan isn't "feeling the Bern." 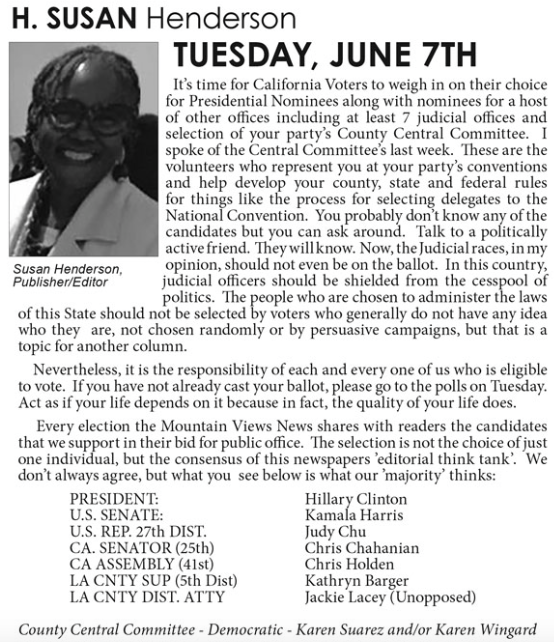 The Pasadena Weekly also picked all tunnel supporting candidates. No coincidence I'm sure. Yes, the fix sure seems to be in on this 710 Tunnel business, and it's all done in dark smoke-filled rooms with no public positions. The Antonovich faction is still trying to run their part of the County like a Banana Republic so they can prop up this truck cargo from their good buddies the port people - out through the 210 freeway High Desert Corridor that Antonovich was planning to retire to as CEO. What better way than to ramrod these "recommendations" into the smaller weekly papers and herd the voters into putting them into power? That way they can duck the public debate. Good heavens, is there really anyone left who would trust Henderson's advice? I am a Democrat,I always vote the Democratic ticket,I am conflicted. Just vote for anyone other than Henderson picks. We know Susan is very dishonest and her choices for these offices tells you all you need to know. Don't vote for them. If Harriet likes these candidates....we know Not to Vote for them! Politicians will do what politicians generally do: take money from big corporate donors and then do the donors' bidding. The trick, of course, is to bamboozle the voter in any way possible, running the gamut from misleading candidate statements and misleading PAC political ads all the way to the creation of organizations like Transparent CA whose moneyed masters really don't want to decrease your taxes but instead want to shift spending from the public agencies and public sector employees to favored private sector corporations. But even if all the legislation and permits for the 710 tunnel are foisted on the misinformed public, do not despair, at least not yet. There is a safety valve, one that often is reviled by certain political groups and their corporate donors as undemocratic even though the latter are the biggest users of it achieve their aims. That safety valve is the judicial system, the system that is often cited as protecting against the tyranny of the majority (which today might more aptly be described as the tyranny of the moneyed minority.) At the very least there will be significant delays, like we've already seen. At best the 710 tunnel project will be seen by the courts as the environmental and SGV lifestyle disaster it will be. A safety album with Obama court picks! Yikes. Only 229 days to go. Let's give 12:28 the benefit of the doubt and suppose he doesn't like President Obama for the latter's left leaning political philosophy. Since President Obama's judicial appointments would also have a tendency to lean left, they would be less inclined to automatically favor large corporations like those that will build the 710 tunnel. So if indeed 12:28 disfavors the 710 tunnel, he should actually want judges selected by President Obama to preside over lawsuits attempting to stop the tunnel project. I suspect, however, that someone who actually counts the number of days left just won't be able to grasp that reasoning. Perhaps the benefit of the doubt proffered in my first sentence is misplaced. 6:06, in baseball we would call your post a "swing and a miss - strike three!" Trite response 4:41. What's the matter? Can't articulate anything specific? Show me where the logic is incorrect. You know you can't, so it looks like I struck out the side. With a choice of Billary and Trump in November, I'll be voting Third Party for the first time in almost 30 years. Please feel free to join me. Gary Johnson. That is who I am voting for.